AMC’s realtiy show “Freakshow” finally comes to Gibsonton where real freaks still live and many more haunt the memories of the remaining sideshow greats. Tonight’s Episode 5 at 10 pm Eastern features legendary showman Ward Hall, his partner Chris Crist, the world record-holding sword swallower Red Stuart along with other World of Wonders cast. Gibsonton, or “Gibtown,” as locals call it, was once home to about 100 sideshow performers – the Monkey Girl, the Half-Woman, Alligator Man and more. Ward Hall and Chris Crist continue to operate one of the only remaining 10-in-One sideshows, that’s 10 acts for one price at the door. Their World of Wonders cast teamed up with the reality show crew last November for the filming of tonight’s episode. Be sure to stick around for the following episode featuring Grady Stiles III who still lives under the shadow of the sensational 1992 murder of his father, “Lobster Boy,” Grady Stiles, Jr. Grady Stiles, III suffers the same congenital deformity, ectrodactyly, as his father which gives his appendages the shape of lobster claws. 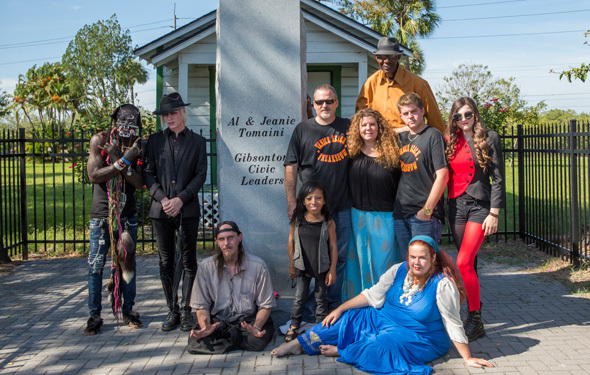 Be sure to follow up your viewing with a copy of Fringe Florida to learn more about Gibtown and the freaks who still call it home.